La Plata County Sheriff’s Office and the Dylan Redwine Task Force is continuing its investigation into the disappearance of 13 year old Dylan Redwine. 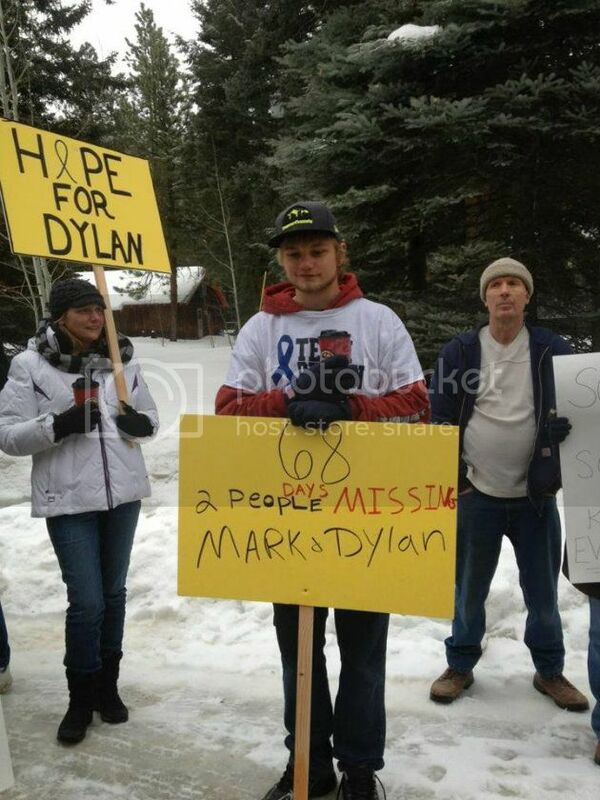 Dylan was reported missing by his father, Mark Redwine on November 19th, less than a day after arriving in La Plata County for a court ordered visitation. LPCSO investigators from three different bureaus are following various tips that come in to the Task Force which consists of five local, state and federal law enforcement agencies . In the past few days, investigators have searched locations on snowshoes, under bridges, and other sites in three different areas in La Plata County and two other locations in Colorado. LPCSO investigators and agents from the FBI met recently to develop strategies and review results of tests of evidence by CBI. Additional interviews are also being conducted locally and outside the area. In several cases, law enforcement agencies not connected to the Task Force have assisted in searches and interviews in Colorado and other states. LPCSO Lt Ed Phippen, Task Force Leader said tips are promptly followed up on, regardless of reliability including several from psychics and mediums. “We want to leave no stone unturned” he said. 5:46PM Dylan arrived at Durango-La Plata airport. The last person identified as having seen Dylan is his father, Mark Redwine. Mr Redwine told investigators he saw Dylan at his Vallecito home early Monday morning, November 19th. Rewards are offered for information related to Dylan’s whereabouts through Durango-La Plata Crime Stoppers (970-247-1112), the FBI, and donations to a private fund. An updated Missing Person flyer was released a few days ago by Durango-La Plata Crime Stoppers. A copy is included in this news release as a separate attachment. Anyone who may have information on Dylan’s whereabouts is asked to contact La Plata County Sheriff’s Office Investigators Dan Patterson (970-382-7015) or Tom Cowing (970-382-7045). There is a local tip line (970-382-7511) where tips can be left on an answering machine that is regularly checked by Investigators. Persons can call Durango-La Plata Crime Stoppers at 970-247-1112. Persons can also call the hotline for the National Center for Missing and Exploited Children at 1-800-THE LOST (1-800-843-5678). BINGO! and if the kid turns up now - dad could do time. Unless the mother has a way to track her son, I think the kids will be withheld and turn up when he's an adult one day. sense ethier,did Dylan pack,and take the bedding to, or wash the bedding? The dogs couldn't get a scent because they had none of Dylan's clothing, but according to the story in this link http://scaredmonkeys.net/index.php?topic=13780.msg1547401#msg1547401 his bedding AND some clothing was available. Or the writer was lying embellishing...imagine that, a reporter straying from the facts. The next morning, Dylan was sleeping on the couch where Mark Redwine now sits and where Dylan's blankets still lie jumbled. Mark said he waited until 7:30 a.m. but still couldn't rouse his son, so he told him he would return about 11. When he got back at 11:30, his son's dirty cereal bowl was beside the sink. The television was on Nickelodeon. His son's fishing pole was gone. So was his black-and-gray backpack. A few articles of clothing were left behind on the couch. This has been bothering me for a long time now. It's as if he is attempting to cover all of his bases, but goes too far. Simply can't put my finger on it. Perhaps it's that you can't communicate with someone you can't rouse. It's just all off, or it's yet more poor reporting. Or a bit of each. According to the above timeline ... Dylan did not respond to Ryan's 9:27 PM text. Maybe he did but that info was not previously released. If not; why not? Was Dylan still enroute to his father's home or had he arrived? The La Plata County Sheriff's office on Thursday released new details about Dylan Redwine's whereabouts the day before he disappeared. Officials revealed Thursday that Dylan arrived at Durango-La Plata airport at 5:46 p.m. Nov. 18; at 7:05 p.m., he was seen at a Durango Walmart; at 7:22 p.m., he went to a Durango McDonald's; and his last text message was sent at 9:37 p.m. on Nov. 18. However ... IF Dylan was texting at 9:27 PM ... maybe he did reach his father's home. The original timeline had Ryan texting ... not Dylan. Who was Dylan texting at 9:37 PM? Was he responding to Ryan's 9:27 PM text? Why is this new information? Can cell towers pings determine the approximate location texting takes place? The road near Mark Redwine's home is very narrow, no place to park or pull off- please drive all the way to the end of County Road 500, there is a camp ground there. The camp ground is closed but the parking area is plowed and many cars can park there. The camp ground is an easy walk to Mark's home. PLEASE CARPOOL! Remember that this is a peaceful gathering. There will be NO violence, name calling, shouting etc. There are many neighboring homes, there will be respect at all times for the property owners. Do not trespass. Do not impede traffic - this is a biggie-again the road is narrow in that vicinity so we are going to have to constantly pay attention to where we are. PLEASE DRESS APPROPRIATELY - we are expecting snow and the temps will be between 30 and 40 degrees. Please bring water and snacks. DO NOT LEAVE YOUR TRASH! The only thing that should be left when we are done are footprints and memories. We are here to support Dylan's family in their efforts to raise awareness and ask for answers. We are soldiers for Dylan, let's make him proud and show the world how this little community Rallies to Never Forget and Never Lose Hope! The last contact from the high school seniors was at about 2:45 a.m. Saturday, when Ziegler sent a text message. Authorities say the message was sent from Interstate 77 in Fairfield County in South Carolina, about 35 miles north of Columbia. Thank you! That actually makes great sense, especially if Mark fished frequently, the dogs were probably following his scent to the lake. Unless they were cadaver dogs, now I have to go back and find that later. Surely they fingerprinted the cereal bowl, if there was one. Really anything Mark says could be, and probably is, a complete fabrication. This is a case desperately in need of some small town, good ole boy justice. 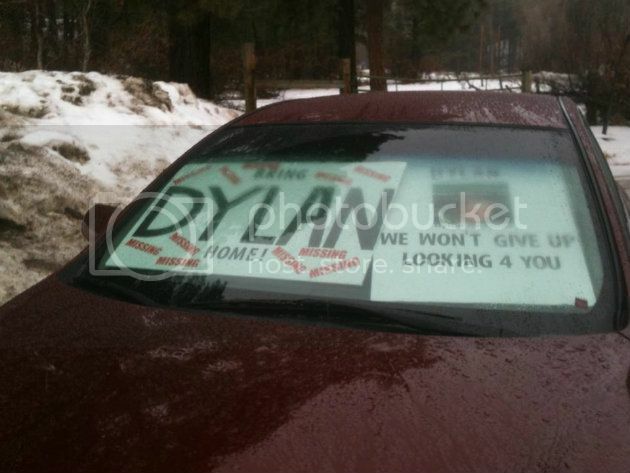 It would be interesting if Dylan had reached his Dad's home or ... was somewhere else. It appears that LE did not have a problem releasing Dylan texting with Mom/Ryan following his arrival right up until 8:01 PM (See above record). However ... the 9:37 PM text with an unidentified person was only released ... released as new information. Why? Protesters outside Mark Redwine's home on Saturday. DURANGO, Colo. - About two-dozen people held a protest outside the home of the father of a missing 13-year-old boy near Durango on Saturday. The protesters targeted the home of Mark Redwine, the father of Dylan Redwine. The boy disappeared just after arriving at his father's home on a court-ordered visit a few days before Thanksgiving. They want the father to be more active in the search for his son. One protester held a sign that said, "Tell what you know." Crimestoppers is offering a $50,000 reward for information leading them to Dylan Redwine. Police are treating his disappearance as a criminal investigation. 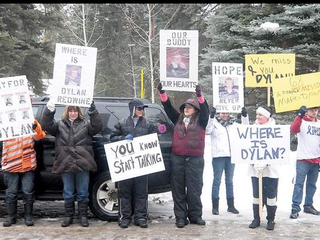 VALLECITO LAKE, Colo. — Braving cold temperatures and a constant down pouring of snow, family and friends of 13-year-old Dylan Redwine came together Saturday to raise attention and awareness for the missing teen. Redwine, who vanished while visiting his father over Thanksgiving break, has not been seen or heard from in over two months. Friends and private donations have raised over $50,000 towards a reward, but investigators have reported a shortage in tips and leads in recent weeks. “I think it’s important to keep it out there about the last physical place that Dylan was supposed to be,” Dylan’s mother, Elaine Redwine, said in an interview Saturday near Durango. More than 25 people showed up outside the missing teen’s father, Mark Redwine’s home, hoping to urge him to be more transparent about his interaction with his son in the hours leading up to Dylan’s disappearance. Mark Redwine, who investigators have reported as being cooperative with their case, decided to leave the Vallecito Lake area this weekend to avoid confrontation with his ex-wife and others. “There’s no reason for anybody to be pointing fingers at me,” Mark said in a phone interview with FOX 31 Denver earlier this week. “Because they want to make me the easiest target to make somebody to blame, I can’t stop them from doing that, but it doesn’t mean I have to agree with it,” he said. Cory Redwine, the missing teen’s brother, has publically asked his father to be more involved with the search to help bring Dylan back home. “Right now it’s just a question mark; he was last the person to see him. He hasn’t done his part in helping find Dylan,” Cory explained. Anyone who may have information on Dylan’s whereabouts is asked to contact La Plata County Sheriff’s Office Investigators Dan Patterson (970-382-7015) or Tom Cowing (970-382-7045). There is a local tip line (970-382-7511) where tips can be left on an answering machine that is regularly checked by Investigators. Persons can call Durango-La Plata Crime Stoppers at 970-247-1112. Elaine Redwine, mother of Dylan Redwine, gives an interview Saturday afternoon while flanked by relatives and friends during a rally for Dylan across the street from the home of Dylan’s father, Mark Redwine, north of Vallecito Reservoir. About 20 people stood out in a rain-snow mix and cold temperatures Saturday morning above Vallecito Reservoir to call on Mark Redwine to be more active in the search for his son, Dylan, who has been missing since just before Thanksgiving. In an interview, Mark Redwine took exception to the portrayal of him as disengaged from the search for his youngest son. “I do a lot of things on my own,” said Redwine, a truck driver. Among his other activities, “every time I get (back) into Durango, I talk to other truck drivers” to have them keep fliers in their rigs, he said. That’s counter to what is being alleged by Dylan’s mother, Elaine, and people like Bayfield resident, businesswoman and Redwine family friend Denise Hess. Hess has helped lead the public effort to find Dylan. Hess claimed that Mark Redwine has been much less involved in the various public activities than have Elaine and Dylan’s next-older brother, Cory, not to mention law enforcement and the general public. Yet Mark Redwine said his ex-wife and Hess actually have left him out of a number of events, sometimes not giving him enough notice to attend. “It’s bizarre to me why Elaine and Denise would leave me out,” he said. Redwine also claimed he was contacted by a woman who wanted to do a raffle to raise money for the Dylan Redwine reward fund, now $50,450, but Elaine Redwine and Hess turned down the offer. “I’m just as much affected by this as these two,” he said. Redwine said that law enforcement even suggested that the Redwines, divorced six years ago, get mediation so they can work together better to find Dylan. So far, he said, Elaine has not accepted. Redwine said his ex-wife has contacted him using text messages. “I’ve responded to every text message she’s sent me, but she won’t pick up the phone ... and talk to me,” he said. The other reason for Saturday’s “walk” was to keep the search for Dylan in the news. “I hate public speaking, and I hate cameras,” Hess said, “but I want to bring Dylan home,” a sentiment echoed by Dylan’s older brother, Cory, who also participated Saturday. “We’re just trying to keep his face out there and just never let it die down until he comes home,” Cory Redwine, 21, said. Several members of the group, who stood on the east side of the road across from Mark Redwine’s house, held handwritten signs directed at him. The “walkers” included Kathi Barry, a political blogger from Evergreen. She saw the notice about a missing boy less than two months after the abduction and murder of 10-year-old Jessica Ridgeway. Jessica was kidnapped on her way to school Oct. 5. Her dismembered body was found five days later in a field in Arvada. Barry said she was bothered by Dylan’s disappearance and eventually decided she needed to come to the Western Slope to help. She has been to the area on weekends, has come to be close friends with Hess and gotten to know Elaine Redwine. But Mark Redwine said he couldn’t understand Barry’s motivation for being so negative toward him, saying that she argues with anyone who doesn’t agree with her positions about what may have happened to Dylan. Cory Redwine said that he and his mother know just about as much now as they did at the beginning of the ordeal. He said law enforcement has searched Mark Redwine’s house and have “gotten clues along the way,” but so far, they have not revealed anything significant to the family. The La Plata County Sheriff’s Office and the FBI met recently to review strategies as well as results from forensic tests by the Colorado Bureau of Investigation, according to a news release from sheriff’s spokesman Lt. Dan Bender. No details were released. He also said his relationship with Mark Redwine has been rocky, but he believes Mark has some answers. Cory said that Mark Redwine usually is not reluctant to be out front. The senior Redwine said there is a “history” with Cory, but he said he thinks his son’s anger toward him is reflective of his mother’s hatred toward Mark. Redwine also said that all the online speculation wasn’t helping the situation. Page created in 4.59 seconds with 19 queries.